If your answer is anything like, “Not enough,” then read on. It’s amazing how conditioned we can become to living our lives according to the plans, ideas, expectations and unwritten rules of others. Many of these externally-established messages are well-intended, positive and helpful. But sometimes the script that others would have us follow in life isn’t exactly what’s best for us. Don’t get me wrong, I’m not saying that as parents, leaders, coaches or caretakers we should abandon the needs of those for whom we are responsible. In these roles, we’re obliged to consider and focus on the well-being of others. But there simply must be room in each dayto tune in to our own needs. Our own voices. So, what is one thing you could focus on for yourself that would build up your own “oxygen” and allow you to better attend to the needs of others? 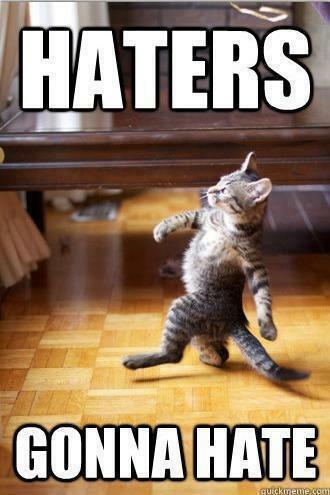 Thanks to my classmate, Valarie Irons-Poppiti for inspring me with her Haters photo post.